On March 9, Wednesday, when the octave had dawned of that blessed count (who had passed from earth to the true octave), Gervaise, according to the agreement with the citizens, was admitted within the town at the Sands, west of the castle, and this was to prove the greatest misfortune for the traitors. But before this, on the same day, by setting some houses on fire he had alarmed Borsiard and Robert the Young and their accomplices who, on seeing the conflagration of the houses, had come out of the castle on all sides to keep an eye on the incendiaries, in case they should attack. Now to the east of the castle three tall houses, set on fire, were burning, the flames fanned by the winds; on seeing this the citizens, at the same time as Borsiard and his knights, and not knowing about the pact which had been formed between the burghers and Gervaise, came rushing forth, most of them in an armed band with those evil men. And Isaac, who during the lifetime of the pious count Charles had, as chamberlain, shared his counsels and been on familiar terms with him, and who was the head of the treachery, made a sortie on horseback with his knights. When the knights on both sides approached each other, the traitors saw they could not stand up against such a great army because they were so few in numbers and turned in flight; their pursuers, following them in hot haste, chased them back into the castle. When they had finally come into the town, Borsiard and his men paused for a few minutes in front of the house of Didier, Isaac’s brother, trying to decide what they should do now. Meanwhile Gervaise, violently pursuing them, went toward the west to the gate of the town, and there, after exchanging pledges of fidelity with the citizens, rushed in with a very strong band. Up to this point the citizens had remained quietly at home according to their custom, for it was about evening and most of the citizens had sat down to eat, not knowing about this event. Then while the traitors were standing there, disturbed about their flight and trying to decide what to do, they saw their pursuers at a distance rushing through the streets, coming after them with spears and lances, arrows and all kinds of arms. Now a great tumult and clash of arms and thunder of shouts disturbed all the citizens who ran to arms and got ready; some who knew absolutely nothing about the pact prepared to defend the place and the town against Gervaise, while others, who did know about it, rushed to Gervaise with all their forces and chased the fleeing traitors back into the castle. When the citizens learned about the pact with Gervaise, sealed by his faith and oath, then for the first time they acted in unison, rushing over the castle-bridge against those who, on behalf of the traitors, were continuing to resist from the castle. At another bridge, which led toward the house of the provost, a great conflict took place in which they fought at close range with lances and swords. On a third bridge, which lay on the eastern side of the castle and led up to the very gates of the castle, such a fierce combat was going on that those who were inside, not able to bear the violence of the attack, broke the bridge and closed the gates on themselves. And wherever the citizens had access to the men in the castle, the fight went on very fiercely until the latter could not keep it up because they were intercepted and taken captive by the citizens. Whether they liked it or not the wretches inside the castle were full of anxiety; a great part of them were wounded and at the same time dispirited by fear and sorrow, and faint from the weariness of fighting. Meanwhile, at the moment when Gervaise entered the town, Isaac fled from the place where they had been talking things over and took refuge in his house, which was fairly strong. And when he had crossed the bridge which led from the town to his house he tore it down and broke it into pieces so that no one could pursue him as he fled. At this time George, the most powerful knight among the traitors, was intercepted; it was he who with Borsiard had killed the count. The knight Didier, brother of Isaac the traitor, hurled him from his horse and cut off both his hands. (This Didier, although he was the brother of the traitor, was not, however, an accessory to the plot.) That most wretched George, his hands cut off, fled to a place where he. hoped to hide but he was immediately denounced to a certain Walter, a knight of Gervaise, and dragged out. The knight, sitting on his horse, ordered a fierce young swordsman to kill him. The latter rushed at George, struck him with his sword and knocked him to the ground; then, dragging him by his feet into the sewer, he saw to it that he drowned for his evil deserts. Robert, a messenger and servant of the castellan, Hacket, who came from his manor, was also intercepted; after being slain in the middle of the market, he was dragged off to the swamps. Another one taken was the most evil of Borsiard’s serfs, Fromold by name, who in his flight had hidden between two mattresses, dressed in a woman’s cloak as disguise. Pulled out, he was taken to the middle of the market and, in the sight of all, hanged with a stick thrust through his shanks and shins, and his head bent down so that his shameful parts, his behind and buttocks, were turned toward the castle to the disgrace and ignominy of the traitors who were standing attentively on the balcony of the count’s house and on the towers watching this done to dishonor them. Meanwhile both sides kept on shooting arrows at each other, and throwing stones and hurling spears from the walls. Finally day closed and by night alarms and vigils prevailed on both sides; and they lay in wait for each other so that no one could steal out to escape from the besieged nor could anyone secretly slip over the walls to aid the besieged. In the same way, throughout the whole course of the siege, both sides stationed watches and laid ambushes. In general, the besieged made an attack on the besiegers every night with the strongest possible forces; and they fought more bitterly at night than by day because the besieged did not dare to show themselves by day, in view of the shamefulness of the crime, but hoped somehow to conceal themselves and escape, if possible, so that if by chance they did get away, no one would suspect them of the crime of treachery. And they fought so much the more fiercely by night, because they had believed they could perhaps come out later and easily be purged of the crime through the influence of the barons of the siege who had looked with favor on their undertaking. But the barons did not care what they promised to the besieged or how many oaths they swore but were concerned only with extorting from them the money and treasure of the good count. And they acted rightly in accepting from the besieged the treasure of the count and also many gifts, since they were under no obligation to keep faith or to honor their oaths toward those serfs who had betrayed their lawful and natural lord. And yet those who had slain their lord, the father of the whole county, tried to get their enemies to respect to their advantage the faith and oaths which they in no way deserved! Certainly it was more just for those who loved the count even in death, and who came to avenge him and there endured alarms and vigils, wounds, attacks, and all the hardships that must be suffered in a siege – more just for them, I say – to have obtained the castle and treasure and rights of the count after the death of their lord than those wretched traitors who destroyed both the place and its riches. In this vein the besiegers and the besieged often talked back and forth to each other, but the besieged only made excuses for their treachery. On March 10, Thursday, the castellan of Ghent with his following hastened to the siege of the betrayers of Charles, and also Ivan, brother of Baldwin of Aalst. On the night before that Thursday, Isaac, because he knew that he was accessory to the crime and damned himself for it, and was driven by fear of death, took to flight with only his squire, and so did his wife and serfs, men and women, and all his household; and wherever they happened to find themselves in that difficult flight by night, there they hid. The house and manor and more valuable equipment, and other things they had once held in freedom and power, they now abandoned heedlessly and left as plunder for the enemy. On hearing this, at early dawn, the castellan of Ghent and Ivan rushed out from the siege with a crowd, seizing everything useful they found that could be carried off. Finally, by placing burning torches under the roofs they set fire to the house and farm buildings, and whatever they found there that could be destroyed by fire. Everyone who saw it marveled at how exceedingly quickly everything was destroyed by the fanning and fomenting of the winds and the mad fury of the fire, for such a big building and such a large amount of wood had never before been so quickly consumed. 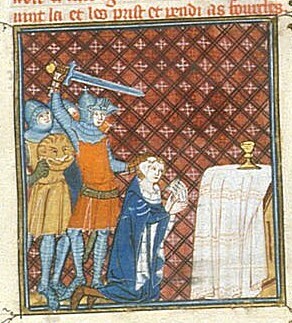 On March 11, Friday, Daniel, one of the peers of the realm; who before the betrayal of the count had been allied in strong friendship with the provost and his nephews, hastened to the siege together with Richard of Woumen, Thierry, castellan of the fortress of Dixmude, and Walter, butler of the count. And so each one of these barons had come with his whole following to avenge the death of his count and lord. Now after meeting with our citizens, and also summoning all the leaders of the siege, they all took an oath, before they were permitted to enter the town, to respect as inviolate the area and property of the town out of consideration for the safety and welfare of our citizens. And they swore that they would then proceed against their enemies with one mind, and would attack, storm, and, God willing, conquer those most impious murderers; and that they would not spare the life of any of the guilty or lead out and save the guilty by any trickery but would destroy them utterly, and they would act in accordance with the common judgment of the barons for the honor of the realm and for the welfare of all its inhabitants. And at the same time they bound themselves to avenge the death of the count without violating the property of the citizens and their people or that of anyone who was taking part in the siege. On March 12, Saturday, the barons ordered all those who had settled down for the siege to attack the castle at every point where they had access to it. And so about noon the knights armed themselves together with the citizens and they made the circuit, setting fire to the gates of the castle, in this enterprise they burned a postern which stood near the house of the provost. But when they were attacking the main gates of the castle, where they had piled up dry hay and straw and summoned a knight to set fire to it, those who were advancing were overwhelmed by stones, sticks, lances, and arrows from within the castle. A great number were wounded by stones as large as millstones hurled from the battlements, and their helmets and shields were crushed so that they could scarcely flee in safety from the shelter of the gates under cover of which they were setting the fires. Therefore when anyone was hit by a store hurled from above, he suffered most grievous injury, regardless of his courage or strength, so that he fell prostrate and broken, dying or dead. In this conflict one squire outside expired, his heart pierced by an arrow. There was tumult and clamor on both sides, and heavy fighting, and the clash and clank of arms reverberated in the high vault of heaven. The fight was still going on at evening, and when those outside had gained nothing but death and destruction, they drew back from the walls and towers of the castle, and assembled part of their forces to take thought for the perils of the night. The besieged were more and more encouraged by this conflict because they had seen their attackers repelled from the walls, undone by so many disasters and wounds. On March 13, the Lord’s day was observed on both sides, under the guise of peace. On March 14 and 15, Monday and Tuesday, burghers from Ghent arrived to take part in the siege, together with a greedy band of plunderers from the villages round about. For their castellan had sent word to them to assemble their communal forces and come, armed and girded for fighting, to make an attack of their own on the castle, by themselves, inasmuch as they were men with a name for conflict and battle who knew how to demolish defenses in sieges. And when they heard that they could make their own attack in the siege, they assembled all the bowmen and skilful makers of military equipment, and also bold plunderers, murderers, thieves, and anyone ready to take advantage of the evils of war, and they loaded thirty wagons with arms. They came in haste, on foot and on horse, hoping to obtain a great deal of money if by chance the besieged surrendered to them. There was certainly a strong and enormous army of them. When they had reached the gates of the town, they dared to enter forcibly, but all the men of the siege, who ran up from the inside, resisted them face to face, and there would have been a general struggle if the wiser ones in both ranks had not come to terms. For, after giving and receiving hands, the men of Ghent pledged themselves by faith and swore an oath that they would join them in the siege and share fully their efforts and arms and counsels, while respecting the place and the property of our citizens, and that they would keep with them only their own men and those who were expert in fighting, and send the others away. Then the men of Ghent came in with a great crowd and filled up the area around the castle. At that time Razo the butler returned from Saint Gilles and came with his following, rightly mourning the death of his lord, the count. …And it should be known that I, Galbert, a notary, though I had no suitable place for writing, set down on tablets a summary of events; I did this in the midst of such a great tumult and the burning of so many houses, set on fire by lighted arrows shot onto the roofs of the town from within the castle (and also by brigands from the outside in the hopes of looting) and in the midst of so much danger by night and conflict by day. I had to wait for moments of peace during the night or day to set in order the present account of events as they happened, and in this way, though in great straits, I transcribed for the faithful what you see and read. I have not set down individual deeds because they were so numerous and so intermingled but only noted carefully what was decreed and done by common action throughout the siege, and the reasons for it; and this I have forced myself, almost unwillingly, to commit to writing. Now the ladders were made [by the besiegers] in this way: at first a wider ladder with rungs was constructed according to the height of the castle walls; to the left and right, green branches, woven tightly together, formed a kind of ‘wall,’ and in front of the ladder a similar ‘wall’ was woven. On this ladder another ladder, longer and narrower, and made in a similar way, was superimposed, lying on its side, so that after the erection of the bigger ladder, the smaller ladder could be slid over the wall of the castle and the woven ‘walls’ to the right and left and in front would protect the climbers on all sides. It should not be forgotten that there were many confined within the castle who were not guilty of the death of the count in deed or in word but had been intercepted with the guilty on the day when the latter had first been shut up within the walls. There were also many who had gone in voluntarily with the criminals and who, though they had not taken part in the deed and actual slaying, were, nevertheless, in sympathy with the guilty. And there were many others who on the first and subsequent days of the siege had gone in for the sake of gain and money; among these was a fiery young fighter named Benkin, expert and swift in shooting arrows. He kept going around the walls in the fighting, running here and there, and though he was only one he seemed like more because from inside the walls he inflicted so many wounds and never stopped. And when he was aiming at the besiegers, his drawing on the bow was identified by everyone because he would either cause grave injury to the unarmed or put to flight those who were armed, whom his shots stupefied and stunned, even if they did not wound. There was also present with the guilty a knight, Weriot, who from the time of his youth had lived as a thief and brigand; he had caused great slaughter among those Making the attack outside the walls by rolling down and hurling stones which he could do using only his left hand. There was indeed an infinite number of the guilty and their accomplices within the walls ready for these evil deeds, day and night; they were engaged in vigils, fights, attacks, and also every kind of exhausting labor, for they had blocked up the gates of the castle on the inside from bottom to top with loads of dirt and stones and dung so that they could not be reached from the outside even if by chance the gates should be destroyed by fire and conflagration. And certainly on the eastern side where fires had been set, the big gates had been almost completely burnt up so that an enormous opening would have appeared if they had not blocked it up with a mound of stuff. Finally, while on the inside they had blocked the exits of the gates with piles of stones and earth, on the outside, at the two ends, both the besieged and besiegers had destroyed the bridges which had formerly led to the castle so that no means of getting in was left to the attackers and no way of getting out to the besieged. When the besieged had made themselves secure at the exits they set about blocking up the doors of the church on the south and the doors of the count’s house that opened out into the castle, and the doors that led into the castle from the cloister, so that if by some misfortune they should lose the courtyard of the count, they could retreat into the count’s house and the provost’s house, and also into the refectory and cloister of the brothers as well as into the church. On March 18, Friday, the ladders were brought out to the walls, and both sides attacked with arrows and stones. Those who brought out the ladders now advanced defended by shields and wearing coats of mail. Many followed, to see how they could set the ladders up against the walls, because they were very burdensome owing to the fact that the wood was green and damp, and very heavy, being about sixty feet in height; the lower ladder was twelve feet wide while the upper ladder was much narrower but a little longer. And while the ladders were being dragged along, the cries and shouts of the pullers aided their hands, and the noise resounded in the high heavens. The men of Ghent, in an armed band, were protecting with their shields those who were dragging the ladders, for the besieged, having heard and seen the dragging, mounted the walls and appeared on the lookout towers, hurling an infinite number of stones and a cloud of arrows against the bearers of the ladders. But notwithstanding, audacious young men, who wished to outstrip the assault of the bigger ladders, set up small ladders such as ten men are accustomed to carry, and climbed the walls one after the other. But when anyone of them reached out to grasp the summit and go over the wall, those hiding inside and lying in wait for the climbers, hurled him back with spears and pikes and javelins as he clung to the ladder so that no one, no matter how bold or swift, any longer dared to approach the besieged by the smaller ladders. Meanwhile, others were trying to drive holes in the walls with the mallets of masons and all kinds of iron instruments, and though they tore away a great part of the wall they had to retire, frustrated. But when the crowd of pullers had come close to the walls, and the fighting grew more bitter on both sides as the overwhelming mass of stones came from inside, the dense shade of night put an end to the fighting on both sides; and the men of Ghent, suffering from many wounds, had to wait for the next day when, with the help of all the besiegers, they hoped to erect the bigger ladders by force and so gain access to the besieged. On March 19, Saturday, when day dawned, the besieged, stationed in various parts of the castle after the day’s fighting, had lain down to rest, thinking they would be safer for a little while since they had fought so well the day before against the men of Ghent outside. With this sense of security after the day’s success, the guards of the walls had even gone into the count’s house to warm themselves because of the bitterness of the cold and wind, leaving the court of the castle empty. Then our citizens, on the southern side where the relics of the saints had been carried out, climbed over the walls by means of slender ladders and lattices which a single man could carry. Once inside, without sound or noise, they assembled in battle-line, ready to fight, and at once ordered the lower ranks among them to go to the big gates and remove the mass of earth and stones from the gates in order to make an entrance for all those still outside who as yet knew nothing about what was going on. They had also found one gate of the castle on the west firmly closed with key and iron bolt, but not obstructed by a pile of earth or stones, which the traitors had kept free so that they could by this means admit or send out anyone they wished. Taking possession of this, our burghers had immediately forced it open with swords and axes, and the ensuing noise and clamor of arms inside threw into tumult and motion the army around the castle. Then a great crowd from the siege rushed into the castle, some to fight, some to plunder whatever they could find inside, others so that once they got inside the church they could seize the body of blessed Count Charles and carry it off to Ghent. Now the traitors, who were lying sunk in deep sleep in the count’s house, were aroused by the great noise, and alarmed, not knowing what had happened; they ran here and there trying to find out what was the cause of the noise. And when they had learned what dangers threatened them, rushing to arms, they took their stand at the doors of the church, awaiting the attack. Some of them were intercepted at one of the gates during the advance of our citizens into the castle; in fact, many knights, to whom the custody of those gates on the east had been entrusted, on suffering the impact of the invading citizens, surrendered to the pity and mercy of their captors when they could do no more. Some of them, despairing of their lives if they were taken by the citizens, slipped over the walls; one of these, a knight, Gilbert, fell in sliding over and died. When some women had dragged him into a house and were caring for his remains, the castellan Thierry and his men, discovering the dead man, dragged him, tied to the tail of a horse, through all the streets of the town and finally threw him into the sewer in the middle of the market and decapitated him. When the citizens realized that they intended to resist at the doors of the count’s house, they climbed the steps leading up to those doors and cut them down with their axes and swords; rushing in on the besieged they pursued them through the middle of the house as far as the passageway by which the count had been accustomed to go across from his house to the church of Saint Donatian. In this passageway, which was vaulted and made of stone, the clash was fiercest; here the citizens were fighting only with swords, face to face, because the besieged scorned to flee further. Putting their strength and courage to the test, on both sides they stood firm like a wall, until the citizens, gathering their forces, put them to flight not so much by fighting as by rushing upon the besieged. Among them was Borsiard, huge and wrathful, ferocious and undaunted, mighty in bodily strength, who resisted the citizens steadily face to face, wounding many, prostrating and hurling down more who were stunned by the hammer‑like blow of his sword. They also put to flight Robert the Young, on whom no one wished to lay a hand because they had heard that he was said to be innocent of the treachery and, even more, because he was so much beloved by all in the realm both before and after the betrayal. That noble one had not troubled to flee but at the request of his friends followed those fleeing; and if this had not been the case, they could have captured Borsiard and his knights on the spot and also all who were guilty of the treachery. And when the traitors had retreated into the church, the citizens did not pursue them further but turned back to plunder and loot, running through the count’s house, and the provost’s house, and the dormitory and cloister of the brothers. All who had taken part in the siege did the same, hoping to lay hands on the treasure of the count and the equipment of the houses located within the walls. And in fact, believing they could loot without any sense of guilt, they set about seizing in the count’s house a great many mattresses, tapestries, linens, cups, vessels, chains, iron bolts, bonds, shackles, fetters, collars, manacles, in other words, the iron instruments of captivity in general, the iron doors of the count’s treasure, and the lead gutters which had carried the water off the roofs. In the provost’s house also they seized beds, chests, benches, clothes, vessels, and all his furniture. In the cellars of the count and provost, and also in the cellar of the brothers, I cannot tell how much grain and meat and wine and beer they seized! In the dormitory of the brothers which was spread with precious and expensive coverings they did so much looting. that they kept on going and coming for that purpose from the time they entered the castle until far into the night. Therefore nothing but the church was left to the besieged except for the foodstuffs they had carried into the church, that is, wine and meat, flour, cheese, legumes, and the other necessities of life. The names of those who were the leaders among the besieged should be told: the castellan Hacket, Borsiard, Robert the Young, Walter, son of Lambert of Aardenburg, Wulfric Cnop. For the provost Bertulf on the third night, that is, Thursday night, before the storming of the castle, after giving a sum of as much as forty marks to Walter the butler was swung down by ropes from beneath his balcony and escaped alone. He trusted Walter more than any man on earth but nevertheless, Walter, after leading him to a wasteland called Mor, abandoned him, exposed to his enemies and forsaken in his flight since in that unfamiliar place he did not know where he should flee or to whom. Then the besieged ascended the towers of the church and rolled down mill stones on those who were moving about in the castle, and they inflicted serious injuries on those who were carrying out all the furniture as loot; many of these, fatally crushed, perished on the spot. The victors of the castle at once shot arrows against the windows of the tower so that no one in the tower could put his head out the windows without having a thousand arrows and a thousand missiles aimed at him. The whole tower looked bristly with so many arrows sticking into it! But since nothing was accomplished in this way on either side, the besieged hurled fire onto the roof of the school, adjacent to the church, trying in this way to set fire to the provost’s house which was next to it. But, frustrated in this, they ran hither and thither on the floor of the church, both in the choir and in the inner sanctuary, armed and watchful, trying to prevent anyone from getting in through the windows or forcibly breaking open the doors of the church. At early dawn, a young man, one of the crowd from Ghent, climbed by ladder up to the chief window of the sanctuary of the church, and breaking the glass and iron work with his sword and pike, boldly slipped in and opened one of the chests of the sanctuary, hunting for booty. Leaning over, he had begun to go through the contents, moving his hand here and there, when the lid of the chest, which was heavy and inclined to fall, struck that thief and looter and threw him back dead; and he lay there dead for a long time, covered up by a pile of feathers, for an enormous pile of feathers was lying in the sanctuary. Meanwhile, when the boy did not return, the men of Ghent, who had been waiting for him for a long time, wanted to force their way through the window, for they had sent him ahead, as the boldest, to try and open a way for them into the church; they had hoped in this way to secure the body of the count. But our citizens resisted them with arms and they have never allowed the men of Ghent even to speak of carrying off the count’s body in their presence. And so, having restored peace in this way, they appointed men who were armed and audacious for the assault on the church. When the best troops were assembled, they broke in by force and rushed through the door of the church that opens into the cloister and chased the besieged from the floor below up into the gallery. And here those serfs, who had impiously and fraudulently betrayed the most worthy count of the land, were now shut in with their lord although it was through no desire of theirs that they were confined with their lord the count. Then at last the men of Ghent, having entered the sanctuary, hunted for the young man whom at dawn they sent ahead through the main window of the sanctuary, and they found him among the feathers, crushed and dead. Some said falsely that he had been killed by Borsiard when he was heedlessly sliding down into the church. There is not time to tell how many stones were hurled from the gallery at the victors on the floor of the church, and how many were struck down, crushed and wounded by spears and arrows, so that the whole choir of the church was covered with piles of stones and no pavement could be seen. The walls and glass windows round about and also the stalls and seats of the brothers were thrown down, and so complete was the ruin and confusion that nothing in the church retained its holy and untouched appearance but everything looked defiled and deformed, more horrible than if it were a prison. For in the gallery the besieged had made defense posts for themselves out of chests and altar tables and choir seats and stools and other furniture of the church, and had tied them together with the ropes of the bells. They broke into pieces the bells and the leads which had formerly covered the roof of the church, using them to crush those below. Within the church, that is, the choir, the fight raged most fiercely, but from the tower and the doors of the tower such slaughter went on that I cannot describe or consider further the multitude of those who were struck down and wounded. On this same day Gervaise had ordered the carpenters to take apart the wooden tower which had been constructed earlier for storming the walls and now stood idle; he had ordered that the strongest beam, separated from the others, should be made into a battering ram by means of which the wall of the church could be breached. Now when the bowmen among the besieged were aiming their arrows at the workmen from their position on the summit of the tower and the strings of the drawn bows were vibrating, a certain bow with its arrow in place fell from the hands of a bowman just in the act of drawing. This was observed by the knights, who were standing by with their shields close to the work of the artisans to protect them as they skillfully operated the engines of war, such as rams, sows, projectile machines, ladders, and the like which are used customarily to destroy walls and stone structures; and they prophesied a most unlucky consequence of the fall of the bow and arrow from the besieged. On the same day, in the evening, a serious disturbance broke out between Gervaise and his men and our citizens. For on the order of the king, and at the command of the barons of the siege, who were trying to speed up the destruction of the besieged, and who had been put to great expense throughout the whole course of .the siege, and had exerted themselves unceasingly in watching and fighting – by their common counsel and by royal edict, I say – a general decree had been issued, to the effect that no one from the whole crowd of the siege should dare to approach the tower and speak to the besieged for fear that the latter might get some idea of how they were going to be taken. The laws also provided with respect to transgressors that if anyone violated this command, he should be thrown into captivity and punished by the common judgment of the barons. And when he had finished his speech, they went together into the presence of the king, and they were again bound to each other in faith and friendship as before. On April 12, Tuesday, the king with the more experienced men and his counselors went into the brothers’ dormitory to determine carefully in advance exactly where the attack on the church should be made. For since the dormitory was next to the church, the experts could prepare inside the building the machines to be used in breaking through the wall of the church and gaining access to the besieged. When those wretches had been unable to hold the lower parts of the church, they had blockaded with wood and stones the stairs leading to the gallery so that no one could go up and they themselves could not come down, planning to defend themselves only from the gallery and the towers of the church. They had in fact set up between the columns of the gallery lookouts and fighting posts made out of piles of chests and benches, from which they could throw stones, lead, and all kinds of heavy things down on the invaders of the church. They had also hung tapestries and mattresses in the openings of the windows in the tower so that missiles and weapons could not by any chance be hurled inside when the tower was being attacked from without. At the very summit of the towers stood the younger men among the besieged who could crush with heavy stones those who were moving about in the court of the castle. And so, having set their affairs in order in such a disorderly way, they were awaiting their end in death, showing no honor or respect to the blessed corpse which lay buried among them in the gallery, except in one respect; that is, although they scarcely called to mind the lord whom they had betrayed, they had placed a candle at his head which burned continuously in honor of the good count from the first day of the siege to the day when their attackers gained access to them. For they had laid out around the tomb of the count the flour and legumes which they consumed daily to sustain life. And when the king and his companions were carefully investigating and were marking the place to pierce the church, Robert the Young, sticking his head out one of the windows of the church, spoke to the knights of the king and begged them to be his messengers to the king, saying humbly that he wished to submit to the judgment of the princes of the land and the barons of his lord, the king, so that according to their law he could deserve either to live, by virtue of his defense, or to be destroyed by the punishment of condemnation if he could not absolve himself. But none of the men dared to go as messengers with these words to the king, because he was so filled with anger against the traitors that he hated even the sight of them. Our citizens, however; and the king’s knights, and all who had heard with what humble language the young man had implored the lord king, suffered with him, dissolved in tears, praying that his lord would take pity on him. On April 14, Thursday, the battering ram, designed to drive a hole through the wall of the church, was brought into the brothers’ dormitory, a hall which was adjacent to the place where the good count’s body was lying in its tomb, commended to God. And immediately the artisans who had made the ram erected high slanting approaches, like stairs, and after tearing down the wooden wall of the dormitory, which had stood next to the church, they placed the top of these “stairs” in such a way that those who dared could ascend armed to the wall of the church. For the workers had laid bare a window’ of the original structure of the church in the old stonework against which they had now placed the stairs. But they lowered the approaches of the equipment temporarily so as to direct the blows of the ram below the window and, once the stone wall was pierced, to secure the window as an entrance, almost like an open door, for the steps were so broad that ten knights could stand on them fighting side by side at the same time. When these were in place, they adjusted the great beam, suspended by ropes, so that it would pierce the church in that very place, above the stairs; and they attached nooses to it and also placed by the nooses armed men who were to draw it back from the church, raised on high, and, once it was pulled back with all their force and strength, to hurl it skillfully and effectively against the wall of the church. Over the heads of those ascending the stairs, coverings of green branches were woven together and inserted in the beams so that if the roof of the dormitory should by some device be broken through by the besieged, those who were driving the ram would be safe under the shelter of the branches. And wooden “walls” had also been placed before them as a protection so that they would not he wounded by arrows or spears coming from inside. Then, having pulled the ram back from the church wall by means of the nooses as far as they possibly could with outstretched arms, all together, with one impetus and. one cry, they drove the great mass and weight of the ram against the church with their maximum strength and effort. At each blow a great heap of stones fell to the ground until the whole area of the wall was perforated in the place where it was pounded. They had equipped the beam in the head of the ram with a very strong piece of iron so that it could not suffer any damage except what it incurred as a result of its own weight and force. The work of ramming was long drawn out; begun at noon it was not finished until after evening had come. Then a great cry arose outside, and all who had fought against the besieged at the doors and in the lower part of the church and through the windows and in every place where they could secure access to them, hearing that the church wall had been breached, were now attacking with greater zeal of spirit and with audacity greedy for victory. And, in fact, they had all fought continuously on both sides from noon to evening, almost succumbing from the exertion of the struggle and the weight of arms. But now, knowing about the opening made by the ram, they were refreshed and strengthened in spirit, as if they had rushed to arms for the first time, and they began to attack the besieged and to pursue them in earnest. The wretched besieged, however, though weak in numbers, were even weaker in the fight because they had the disadvantage of fighting, not all in one place, but rather at all the points of access, that is, at the doors and windows, in the choir and especially in the place which the ram had now taken over. Having suffered to the bitter end the misfortunes of life, and now fighting separately on all sides, they were henceforth anticipating ruin and destruction at the hands of their enemies. Those in the Church who had been hurling stones, arrows, pikes, stakes, and all kinds of spears against the drivers of the ram were even more fearful because they were few in number and because, separated from their companions and almost succumbing from their day‑long struggle, they were fighting against such a strong army. What is more, lacking arms, they did not have the means of defending themselves; they resisted, nevertheless, as much as they dared. But when the drivers of the ram, and other knights of the king, and the young men of our place; armed and avid for conflict, finally saw the besieged opposite them, they summoned all their courage. They may have been picturing in their mind’s eye how noble it would be to die for father and fatherland, and what an honorable victory was set before the conquerors, and how infamous and criminal those traitors had been who had made a den for themselves out of the church of Christ, but in fact it seems more likely that they were intent on rushing against the besieged because they were avid and greedy to seize the treasure and money of the lord count, and that for this reason alone they were hastening forward. But regardless of motives, they hurled themselves through the middle of the opening in one rush, without order, without line of battle, without any thought for the arms they bore, so that by rushing in all at once they could prevent the besieged from having any time: or place in which to fight and kill anyone. For they did not cease to rush in until they lead transformed themselves into a kind of continuous bridge, and, by the marvelous dispensation of God, they advanced without mortal danger to their lives, some dashing, others stumbling, some pushed in forcibly, others falling down and trying to get up again, some in complete confusion, as is usual in such a great tumult. Not only the church but the whole castle and its vicinity was filled with the sound of their shouts and cries, with the noise of their passage, the crumbling of the wall and the clamor and clash of arms. Outside they were praising God and thanking him for this victory by which He honored the victors, glorified the king and his men, cleansed his church in part from the defilers, and made it possible at last for that glorious martyr, his count, to be mourned by the pious veneration of good men and to be sustained by the prayers of his faithful. Now at last Fromold junior [a notary and supporter of Count Charles] was able to do what had not been possible before and what he had long and ardently desired, to offer prayers to God for the salvation of his lord, the count, to make a sacrifice in tears and contrition of heart, and to rejoice greatly in the sight of the place where his lord, buried, was resting .in peace; and so for the first time he was preparing funeral rites for his lord whom he had not been able to see since he was buried, that is for forty-four days. Since he could see not his body but only the outside of the tomb, he wished and implored with the prayer of both lips and heart that God on the day of common resurrection would permit him finally to see his lord and prince, Charles, raised to double glory among the faithful rulers and highest princes of his present Church, and to stay with him and be blessed with him eternally in the glory of the contemplation of the Holy Trinity. Therefore he considered it a great boon to be able to mourn the death of his lord at his tomb, to lament the ruin of the fatherland, and to perform with the greatest love the last rites for one whom he had cherished in life, now betrayed by his serfs. He did so, indeed, not without tears. Oh God, how many prayers of your faithful you deigned to receive on that day! Whatever part of the divine cult had not been performed in that church was more than compensated for in that hour by the magnitude and multiplicity of the prayers of the just. A wax candle was standing at the head of the count, placed there by the traitors in honor and veneration of their lord. Now after they had rushed into the church against the besieged and a great clamor had arisen in the pursuit, those most wretched of men had retreated both from the hole in the wall and from the doors and defense posts and, ascending the tower to defend themselves, they were resisting their attackers on the stairs. Therefore the victors, the most Christian knights of the king of France, hastened to obstruct and block up the stairs with stones and wood, with chests and beams and other bulky things so that none of the besieged could come down into the gallery where the count was lying. And now the king, coming to the church, mourned the death of his cousin, Charles, and placed a guard to watch the tower carefully; in alternating vigils the king’s knights watched the tower where the besieged were. Whatever was found in that gallery which could be seized was anybody’s loot. Finally the canons of the church, climbing up on ladders to the gallery from the choir, arranged for certain of the brothers to keep vigils every night around the count’s tomb. Looking around, they saw that although the church vessels were shattered and nothing was as it had been before, the altars and altar tables by God’s care had remained in place, and with great rejoicing the brothers took possession of whatever they found, not by right or merit, but only by the gift of God. Then God brought that day to its conclusion by closing up his enemies and giving victory to the faithful, exalting the name of his power to the ends of the earth. The besieged, however, did not desist from setting watches in the tower, sounding their horns and acting proudly in such straits as if they still possessed some authority, not recognizing how extremely wretched they were, for they were confirmed reprobates. Therefore whatever they did henceforth was not pleasing to God or men but was reprobate and hateful. This section is originally from Galbert of Bruges, The Murder of Charles the Good, translated by James Bruce Ross (Columbia University Press, 1953). We thank Columbia University Press for allowing us to republish this section.